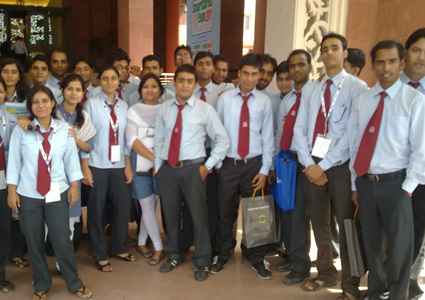 September 2011 The great day for GL Bajaj of MCA 2nd year and 3rd year students that every student got the opportunity to attend the exhibition on Smart Card. Which was organized in Hotel Ashoka, New Delhi. Every student got the vast knowledge about the technology of from various companies like CFC, Marks-Zet, Brvkle, Bayer Material Science, Teslin Maze Cards, KBA, SPS etc. Student personally met Mr. Navneet Jain from A2Z Maintenance & Engineering Service Ltd. And Mr. Ravi Bhushan from Core Televentures Pvt. 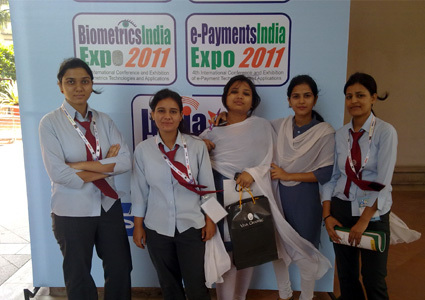 Ltd. Every student had the knowledge about the thumb scanning, cross finger print technology, RFID technology , Biometrics, UID Cards, GPS and GIS system etc. By the Teslin Maze Card the student learn which paper is used to make smart card. The industry tour was very much helpful to every student.